✔️ PERFECT QUALITY--Our brand new rolling mobile file storage cabinet with 3 drawers is ideal for use in both home and work place. With 3 drawers, this storage cabinet provides you with plenty of space to store your important and frequently used documents. And the three drawers can be locked, so it can keep your document safe; and the top drawer has small compartments for your small items. ✔️With wheels, you can easily move the cabinet between rooms. Designed with a super-durable steel construction and electrostatic spraying surface, this file cabinet can also enhance the aesthetics of a room. Do not hesitate to buy one! ✔️Brand new and high quality Solid steel construction, durable and sturdy With electrostatic spraying finish for long-lasting usage Keep your supplies organized 3 drawers with smooth glide suspension Drawers lock to secure your letter-size files 5 wheels: 2 front wheels with brake function, 1 auxiliary wheel under file drawer prevents tipping Perfect for home and office use Including two keys Assembly required. 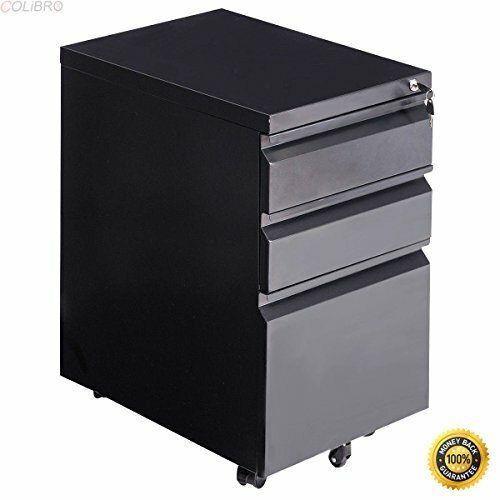 ✔️Color: Black Material: steel Surface treatment: Electrostatic spraying Overall dimension: 15"×19.8"×25.7" (L×W×H) Small drawer dimension inner: 12"×15.7"×3.7" (L×W×H) Big drawer dimension inner: 12"×15.7"×10.2"( L×W×H) Net Weight: 37.7 Lbs Package Include: 1× 3-Drawer Mobile File Cabinet. If you have any questions about this product by COLIBROX, contact us by completing and submitting the form below. If you are looking for a specif part number, please include it with your message.